So, new House Speaker Paul Ryan, you insist on lots of family time for yourself, but oppose paid family leave for other people. How do you explain yourself? GO! "'I don't think people asked me to be speaker so I can take more money from hardworking taxpayers to create some new federal entitlement. 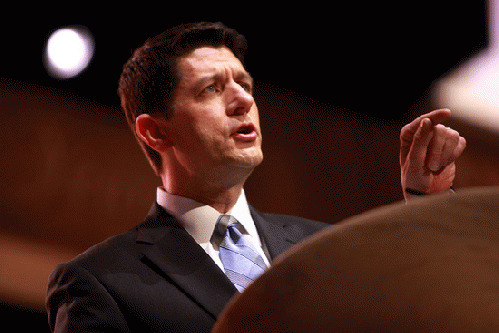 But I think people want to have members of Congress that represent them, that are like them,' Ryan said. 'Don't you want your member of Congress to be a citizen legislator who lives with you, among you, who has your own kinds of concerns, who wants to spend time with his children on Saturdays and Sundays? "Ryan made a similar comment to CNN's Dana Bash on 'State of the Union,' saying, 'I don't think that sticking up for being a person with balance in your life, for wanting to spend your weekends in your home with your family ... I don't think that means signing up for some new unfunded mandate.'" He doesn't want to take money from hardworking taxpayers ... to give those hardworking taxpayers paid leave if they have a child or need to care for a sick family member. He opposes an unfunded entitlement ... except that "unfunded entitlement" is, in California for instance, actually a small payroll deduction that's helped 1.8 million Californians take paid leave, 90 percent of them to care for a new baby, over the law's first decade, without hurting businesses or killing jobs. In short, Paul Ryan does not care about the facts. He cares about spending time with his family while standing in the way of you doing the same. He has a job that lets him make that kind of demand, and if you're not so lucky and powerful, screw you. Basic rights for you -- the kind of thing that three American states and virtually every other country on earth can somehow provide -- can be boiled down to meaningless Republican buzzwords for "no."